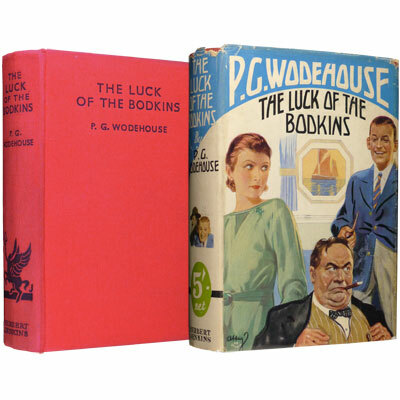 The Luck of the Bodkins - P. G. Wodehouse 1935 - Herbert Jenkins, London - First Edition, first state, in later issue dust jacket	Things on board the R. M. S. Atlantic are terribly, terribly, complicated. A lovely bright copy of the first edition, in scarce later issue dust jacket (matching the first issue jacket, with the exception of the text to the flaps). References: The Russian Wodehouse Society. McIlvaine A54a. First state cloth - red with black lettering A54a (second state was issued in orange cloth, and front panel was bordered in black A54a(2)).